Aims: Nosocomial infection is associated with increased mortality, morbidity, and length of stay. Detection of infection, identify the etiology of bacterial antibiotic resistance pattern, is necessary given the widespread use of antibiotics and antibiotic-resistant organisms. Materials and Methods: This cross-sectional study was done on 288 patients admitted to the Beheshti Hospitals in Kashan based on NNIS definitions according to the state of Health and Medical education. In this study infections and antibiotic resistance symptoms were found. Data analyses were performed with Chi-square test. Results: Among the 288 patients studied, with mean out of hospital infection was 0.80%. Most cases of infection associated were pneumonia. The highest rates of infection were in the Intensive Care Unit (ICU) with 51.7%. Nosocomial infection in ICU wards was associated with increased mortality and morbidity. The most common types were ventilator-associated pneumonia. Among the microorganisms, negative Gram was seen more. The common pathogens were including Acinetobacter, Escherichia coli, and Klebsiella. Antimicrobial resistance was generally increasing and had emerged from selective pressure from antibiotic use and transmission through health staff. Conclusion: This study showed a correlation between antibiotic use and resistance of microorganisms is significant. Hence, it seems that reducing aggressive acts and conduct hygiene education and monitoring act of antibiotics is necessary to prevent antibiotic resistance. Hospital-acquired infections (HAIs) are among the major problems in health-care centers because they increase mortality rate and hospitalization costs. Therefore, due to the widespread use of antibiotics (a major cause of incidence of HAIs) in hospitals, it is necessary to identify infection cases, microbial etiology, and antimicrobial resistance patterns. HAIs are limited or diffuse infections caused either by pathogenic reactions of an agent or its toxins in hospitals. They develop within 48–72 h after the hospitalization of a patient. At the time of admission, the person should not show obvious symptoms of the relevant infection, and the disease should not be in the incubation period. HAIs are among the major problems in hospitals and medical centers and a significant cause of increased mortality and morbidity rates. Many types of pathogens are resistant to antibacterial agents and antiviral and this creates problems in patient treatment. This is one of the most important issues in the Intensive Care Units (ICUs). Excessive use of antibiotics and immunosuppressive drugs prolongs the length of stay and increases the hospitalization costs. On the other hand, prolonged length of stay will also increase the risk of developing HAIs. Meanwhile, hospital authorities can control the number of infection cases and prevent their spread at very lower costs through observing health issues in hospitals and microbiological diagnosis of diseases. Proper selection of antibiotics, including the correct type of antibiotic, proper dosage, sufficient time, and controlling the use of antibiotics, can prevent the incidence of resistance or reduce its increasing trend. The study was a retrospective study in Beheshti hospital of Kashan over a 1-year period. All case records of patients admitted into the wards during the period of March 2012 to February were reviewed, and those who were identified to have developed infection from 48 h after admission up to 2 days after discharge were recruited. Accordingly, outpatients and those who were hospitalized for <48 h were excluded from the study. Data collection was designed on the basis of a questionnaire of National nosocomial infections surveillance (NNIS). According to standards of care definitions of nosocomial infections, Ministry of Health and Medical Education (NNIS) was divided, infections of urinary tract, surgical infection, blood infection, and pneumonia. The study was conducted according to the Declaration of Helsinki and participants signed an informed consent form approved by the Ethics Committee of the Faculty of Medicine. Information entered in the application SPSS 19 (IBM SPSS Statistics for Windows, Armonk, NY: IBM Corp) and was performed by Chi-square test. In this study, 288 patients with nosocomial infections were had been investigated in 2013. The incidence of hospital infections was with an average of 0.80%. The number of cases of nosocomial infection was 288 cases of patients hospitalized more than 48 h in the hospital. The total number of hospital deaths in 2013 was unknown. Pneumonia (60.42%) was the most common infection, followed by surgical site infection (22.5%), urinary tract infection (10.76%), blood infections (4.17%), and other infections (2.08%). The highest rate of infection in ICU wards (51.7%) was ventilator-associated pneumonia (VAP). The most common infections among men were pneumonia (55.17%) and among women were urinary tract infection (61.3%). Hospital-acquired pneumonia with 48 h or more after admission was one of the main causes of fatal infections.Forty-eight hours or more after ending of tracheal intubation, clinical prevalence of it diagnosed 13%–16%, although rates are much lower using stricter definitions monitoring. While the crude mortality rate was usually 20%–30% that have been reported. Infection rate was observed more in men with 53.82% [Table 1] and [Figure 1]. The most dominant microorganisms in pneumonia were observed Acinetobacter (76.41%) and surgical site (22.63%) in urinary tract infections were Escherichia More Details coli (42.85%) and in blood infections were coagulase-negative staphylococci (15.21%). 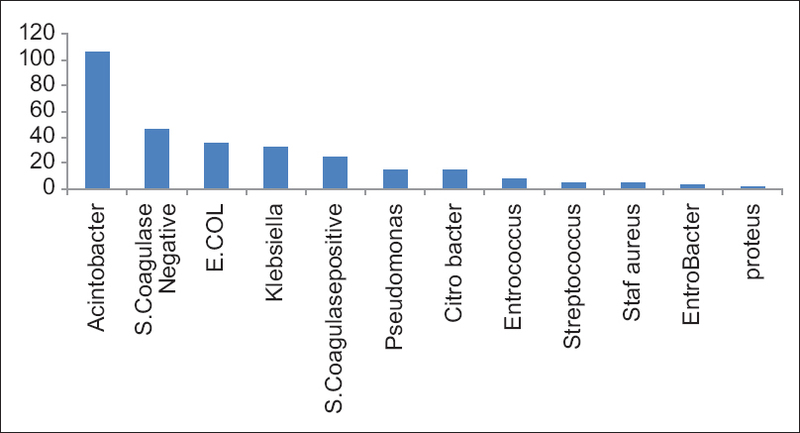 The most types of microorganism had observed Acinetobacter [Table 2] and [Figure 2]. The relationship between in two groups of men and woman in the distribution of nosocomial infections was not observed statistically (P = 0.47). In this study, most patients with nosocomial infections underwent several invasive interventions during their hospitalization; however, suction and ventilator-assisted breathing were the most frequent invasive interventions, respectively [Table 3]. The study of antibiotic resistance, highest resistance, was in the group of cephalosporins and ampicillin. This table shows the susceptibility degree measured for a different antibiotic in the cases examined [Table 4]. In this study, the prevalence of HAI or nosocomial infection was 0.80%. In other studies, the incidence of infection was different., This may be due to the differences between methodologies and sampling tools. Ghorbanalizadegan et al. (2007), in their study conducted in Baqiyatallah hospital, Tehran, reported a prevalence rate of 3.9%. Pneumonia was the most common infection (60.4%) and its mortality rate was 40%–70%. In this study, Acinetobacter was the most dominant microorganism. In the study of Ghorbanalizadegan et al., the prevalence of resistant Acinetobacter cases was 3.1%. Most of the infection cases were observed in the ICU, and this is consistent with our study. The most common invasive measures included suction, ventilation, and intravenous feeding. In this study, there was a significant relationship between invasive methods and the severity of infection. In addition, Acinetobacter was the most dominant microorganism in this study. In Jason's study (2015), which was conducted with title nosocomial infections in the ICU; the highest prevalence infection was seen in ICU ward. Early detection of patients at risk for nosocomial infections is essential; this particularly important in ICUs. The necessary instructions should be implemented as key steps for the proper management of vulnerable patients. Needed policies against antibiotic resistance must be applied. The study also suggests that further attention must be paid to health-care staff training not only in ICUs but also in other care units. This study was financially supported by Kashan University of Medical Sciences. The efforts of all the honorable officials at this center are hereby appreciated and acknowledged. This work presents part of the findings of the research project No 9279 in Kashan University of Medical Sciences. Fridkin SK, Welbel SF, Weinstein RA. Magnitude and prevention of nosocomial infections in the Intensive Care Unit. Infect Dis Clin North Am 2012;11:479-96. Johnson JK, Smith G, Lee MS, Venezia RA, Stine OC, Nataro JP, et al. The role of patient-to-patient transmission in the acquisition of imipenem-resistant Pseudomonas aeruginosa colonization in the Intensive Care Unit. J Infect Dis 2009;200:900-5. Hooton TM. Nosocomial urinary tract infections. Principles and Practice of Infectious Diseases. USA: Elsevier-Churchill Livingstone Publishers; 2010. Kuster SP, Ruef C, Ledergerber B, Hintermann A, Deplazes C, Neuber L, et al. Quantitative antibiotic use in hospitals: Comparison of measurements, literature review, and recommendations for a standard of reporting. Infection 2008;36:549-59. Thom KA, Hsiao WW, Harris AD, Stine OC, Rasko DA, Johnson JK, et al. Patients with Acinetobacter baumannii bloodstream infections are colonized in the gastrointestinal tract with identical strains. Am J Infect Control 2010;38:751-3. Kaki R, Elligsen M, Walker S, Simor A, Palmay L, Daneman N, et al. Impact of antimicrobial stewardship in critical care: A systematic review. J Antimicrob Chemother 2011;66:1223-30. Halaby T, Al Naiemi N, Kluytmans J, van der Palen J, Vandenbroucke-Grauls CM. Emergence of colistin resistance in Enterobacteriaceae after the introduction of selective digestive tract decontamination in an Intensive Care Unit. Antimicrob Agents Chemother 2013;57:3224-9. Sievert DM, Ricks P, Edwards JR, Schneider A, Patel J, Srinivasan A, et al. Antimicrobial-resistant pathogens associated with healthcare-associated infections: Summary of data reported to the National Healthcare Safety Network at the Centers for Disease Control and Prevention, 2009-2010. Infect Control Hosp Epidemiol 2013;34:1-4. Huskins WC, Huckabee CM, O'Grady NP, Murray P, Kopetskie H, Zimmer L, et al. Intervention to reduce transmission of resistant bacteria in intensive care. N Engl J Med 2011;364:1407-18. National Nosocomial Infections Surveillance System. National Nosocomial Infections Surveillance (NNIS) System Report, data summary from January 1992 through June 2004, issued October 2008. J Infect Control 2008;32:470-85. Dethlefsen L, Relman DA. Incomplete recovery and individualized responses of the human distal gut microbiota to repeated antibiotic perturbation. Proc Natl Acad Sci U S A 2011;108 Suppl 1:4554-61. Wright GD. The antibiotic resistome: The nexus of chemical and genetic diversity. Nat Rev Microbiol 2007;5:175-86. Ghorbanalizadegan A, Ranjbar R, Esmaeili D, Hajia M. The Prevalence of Multi-Resistant Pseudomonas aeruginosa and Acinetobacter spp. in Patients Addmited in Baqiyatallah Hospital in 2005. Journal of Ilam University of Medical Sciences. Available from: http://sjimu.medilam.ac.ir/article-1-13-fa.html. Ozayar E, Degerli S, Sahin S, Koç F, Filiz Koç, Three-Year Evaluation of Nosocomial Infection Rates of the ICU. Brazilian Journal of Anesthesiology 2013;63:73-84. Bekaert M, Timsit JF, Vansteelandt S, Depuydt P, Vésin A, Garrouste-Orgeas M, et al. Attributable mortality of ventilator-associated pneumonia: A reappraisal using causal analysis. Am J Respir Crit Care Med 2011;184:1133-9. Climo MW, Yokoe DS, Warren DK, Perl TM, Bolon M, Herwaldt LA, et al. Effect of daily chlorhexidine bathing on hospital-acquired infection. N Engl J Med 2013;368:533-42. Jason A, Alexander A. Nosocomial Infections in the Intensive Care Unit. Anaesthesia & Intensive Care Medicine 2015;16:598-602. Dudeck MA, Horan TC, Peterson KD, Allen-Bridson K, Morrell G, Pollock DA, et al. National Healthcare Safety Network (NHSN) Report, data summary for 2010, device-associated module. Am J Infect Control 2011;39:798-816. Mohajeri P, Gholamine B, Fathi M, Rezaei M, Zahrabi A. Antibiotic resistance of clinical isolates of Acinetobacter baumannii in hospitals of Kermanshah Iran during one year. J Kerman Univ Med Sci 2012;19:405-12. Duque AS, Ferreira AF, Cezario RC, Gontijo Filho PP. Nosocomial infections in two hospitals in Uberlandia, Brazil. Rev Panam Infectol 2009;9:14-8. Iliyasu G, Daiyab FM, Tiamiyu AB, Abubakar S, Habib ZG, Sarki AM, et al. Nosocomial infections and resistance pattern of common bacterial isolates in an Intensive Care Unit of a tertiary hospital in Nigeria: A 4-year review. J Crit Care 2016;34:116-20. Ramírez-Wong FM, Atencio-Espinoza T, Rosenthal VD, Ramirez E, Torres-Zegarra SL, Díaz Tavera ZR, et al. Surgical site infections rates in more than 13,000 surgical procedures in three cities in Peru: Findings of the international nosocomial infection control consortium. Surg Infect (Larchmt) 2015;16:572-6. Brusselaers N, Vogelaers D, Blot S. The rising problem of antimicrobial resistance in the Intensive Care Unit. Ann Intensive Care 2011;1:47. Thijm HA, van der Waaij D. The effect of three frequently applied antibiotics on the colonization resistance of the digestive tract of mice. J Hyg (Lond) 1979;82:397-405.